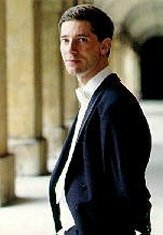 Robert King (RK) is the founder and director of The King’s Consort (‘TKC’), and has gained a reputation for performing and recording less familiar Handel English oratorios. Robert’s new Hyperion recording of Handel’s Ode for St. Cecilia’s Day is probably his last major Handel recording for the near future because, thanks to his work, there are no longer many gaps in the discography left to fill. David Vickers (DV) spoke to Robert in September 2004, at around the time of the Cecilia Ode’s commercial release and The King’s Consort’s performance of Monteverdi’s 1610 Vespers at the BBC Proms. DV: What were your first meaningful encounters with Handel's music? RK: When I was a boy chorister at St John's College Cambridge we sang music from every period under the sun, including the occasional Handel chorus. As a chorister I was hugely influenced by George Guest, and was part of a particularly rich seam of choristers who are now spread widely across the music business: later on Donald Paine was the wonderful director of music at Radley - my "public" school – and he was wonderfully supportive to me. But my main experiences in Handel didn't come until University. DV: Like other well known British early music performers, you studied at Cambridge. Did you develop your interest in directing baroque music there? DV: What do you particularly admire about Handel? RK: He has such a sense of drama, whether it is in the operas or in the oratorios. Of course, the oratorios have the added benefit of a chorus, which I think always adds such a lot to a performance. But I don’t have a ‘favourite’ piece because that has to be whichever piece I'm currently performing. That way you are totally committed to the job in hand! DV: Your Hyperion recordings of Handel have concentrated mostly on lesser known oratorios in English. Did that arise from your interest in Purcell? RK: Handel Oratorios are such good music, and in fact we recorded them roughly in parallel with our three big Purcell series. There wasn't any chain of one composer leading to the other. One of The King’s Consort's earliest discs for Hyperion was Joshua, which at the time had no decent recording at all, certainly not on period instruments. When that sold very well, I suggested to Ted Perry at Hyperion that we should follow it up with Judas Maccabaeus. He needed little encouragement, and was rewarded when it sold even better than Joshua! It all started there. DV: and then there was a premiere recording of Deborah. Winton Dean infamously remarked that "Deborah is a failure". What do you think of that verdict? RK: Several critics have written articles and books purely by looking at the scores - never actually hearing the music, or certainly not in a decent performance. Winton Dean is undoubtedly a great scholar, but perhaps even he would now admit that his judgement went slightly off-centre when he was writing about Deborah. It's not a failure – we performed it at the BBC Proms before recording it, and the ecstatic reaction of 5000 Prommers was as good a democratic vote for Handel as I've seen! DV: You've recorded all Handel's military oratorios from the mid-1740s. Do you think they all have their own distinct identity? RK: Across Handel oratorios you can often see a loose similarity in the overall framework, but then you get into the actual music and you keep discovering new jewels. Handel constantly surprises you! The Occasional Oratorio is certainly one of the most heavily recycled of the oratorios, but when it's full of great tunes does that really matter so much? RK: That’s difficult! To form a reliable opinion about that would require me to go back and revisit all those hours of recordings - and take me some several weeks! When I've finished a project - rehearsals, the concerts, recording sessions, all the post-production of editing music and writing notes, checking proofs and so on - and when the disc arrives, I check the first ten seconds of the pressing are right. I tend to be so relieved that I put it on the shelf and don't take it down for years! Nevertheless, it is interesting that when a concert performance suddenly looms again the music is still firmly in my memory bank and comes back ever so fast. DV: The Choice of Hercules badly needed a good recording, and your response to this need won the International Handel Recording Prize. RK: This really was a case of getting close to completing our Handel "cycle". For some years I knew there was no decent recording of the work and I already knew several lovely arias from it; the story was very attractive, so we just had to get all that music onto disc. DV: The Coronation of George II was an elaborate project. What were your reasons for creating this reconstruction? RK: The Coronation of King George II has been a huge success for us, performed more times than any other major TKC programme. I've always loved drama and the concept of reconstructing an event - I love staging things, working with lighting and movement as well as music, using spaces and making the audience feel part of an event, so this was the perfect project. Our big Venetian reconstruction Lo Sposalizio had been immensely successful, and I was looking for a similarly dramatic project. A beer with my great friend Crispian Steele-Perkins at the back of a plane found the solution: I wanted to stage a reconstruction of a coronation, it had to be eighteenth century, preferably English, and with great music. In 45 seconds we had both hit on the 1727 coronation as being the perfect occasion: within two days of getting home the whole project was, in outline, completely in place. It really was the most natural of births! DV: You recently performed L'Allegro at the Handel Festival in Halle. What is it like touring with a big work like that? RK: It's terrific. However many Handel oratorios you perform, there's always a great frisson as you start the overture and know there's a good couple of hours or more of great music ahead! DV: Now you have recorded the Cecilia Ode and the little-known cantata "Cecilia, volgi un sguardo". I guess this marks the completion of another series, with you now having recorded all the music Handel created to fill out Alexander’s Feast. [i] It’s a lovely disc, and the soloists are ideal. RK: The night before the recording sessions began there was a huge emergency when the soprano soloist I had engaged for the project fell ill. My great friend Carolyn Sampson stepped in at 11pm with sessions starting the next afternoon, and effectively sang the whole project at sight. Amazingly - or perhaps as a result - she sounds even more wonderful and totally at ease than usual! She really is an astonishing singer and I am especially proud of the disc. There is great singing, but also fantastic obbligato instrumental playing, and great ensemble work. DV: You've done copious amounts of Vivaldi, Purcell, Handel, and now Monteverdi. Do you see yourself returning to Handel again? RK: With recordings? Just possibly, but it is hard to predict at the moment where we can go next. But as for concert projects, of course they will continue apace. RK: Sadly, it's entirely down to CD sales. Though projects in the opera house are very popular, Handel opera on disc seems not often to get its money back for the company concerned: Ottone was a dreadful loser in the shops for Hyperion. I've never dared suggest another opera to them! We performed Ezio, and it was broadcast on BBC Radio 3, but we never recorded it. DV: You prepare your own practical performance editions for Hyperion recordings. How do you go about this work, and does it bring you closer to the music? RK: If there are a variety of editorial decisions to be made, it's always easiest that you make these yourself. Then you can't disagree with the editor so much when it comes to performance time! Of course I am lucky to be able to take good advice from respected scholars, but after so many years recording tens of thousands of minutes of music by Handel, Purcell and Vivaldi I know their musical styles very well and tend to head off in the first place in the direction that my instincts take me. It's a relief how often that gut feeling later turns out to be provable by scholarly processes as well! DV: You've worked with many of the finest British singers and players who specialise in period-instrument performance. RK: It's nice that you mention the players as well as those front cover soloists, because TKC is very much about the whole team, not just individual stars. I am so fortunate to have worked with so many great singers and instrumentalists. After so many years, we are all very flexible in being able to return to a style, even if we haven't visited it for a few months. Certainly Handel is very much in the blood of English period performers. DV: You've worked a lot with experienced senior early music figures like James Bowman and Crispian Steele-Perkins, as well as encouraged younger talent like Robin Blaze and Carolyn Sampson. Is this a conscious decision? RK: The King’s Consort has always made an absolute priority to give really talented players and singers of the latest generation the chance to show themselves, and to learn - and there is no better way to learn than to stand alongside the greats. Nothing makes me happier than to see someone who started out with great talent but little experience gradually taking the international stage. A very few of them have become so grand that they have forgotten how they got to where they are, but the vast majority remain a happy and successful part of The King’s Consort's extended musical family - even if sometimes they are so busy we can't get them for years to come! [i] ‘Look down, harmonious Saint’ (recorded by King with Acis & Galatea) was composed for insertion into the original 1736 run of Alexander’s Feast, but Handel rejected it in favour of ‘Cecilia, volgi un sguardo’. The Ode for St. Cecilia’s Day (1739) and The Choice of Hercules (1751) were both composed as interludes for revials of Alexander’s Feast, which was too short to fill an entire evening.